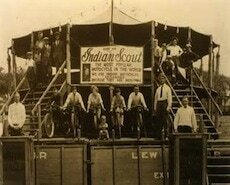 We are so excited to be able to tell you that the Fox Family will be bringing the Original Wall of Death to BFoM 2017. If you haven't had the chance to experience the wall of death before, it is truly breathtaking. The speed, the skill, the smell and the noise are intoxicating. How they do the things they do on the wall is beyond belief. Only a few survived the war, including this one which rose from the ashes to entertain once more! ​Generations passed until eventually it landed in the hands of Ken Fox and his two sons, Luke and Alex Fox. The Fox family continue to preserve the history of the Wall by keeping her touring and doing restoration work in the winter months. a handful of people able to meet the exacting standards required. There are only twoWalls of Death in this country, one of which is the famous Ken Fox Wall. The Wall of Death is indeed one of the last great live shows travelling today and is a major attraction at many events throughout the UK. and has numerous television appearances to his credit, including ITV's Heartbeat and You Bet. 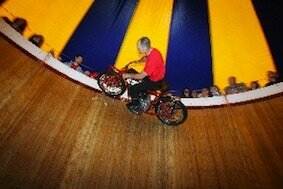 The Ken Fox Wall of Death is also the one featured on BBC1 and has recently been on Blue Peter. The show is also regularly seen on the Discovery and other satelite channels. 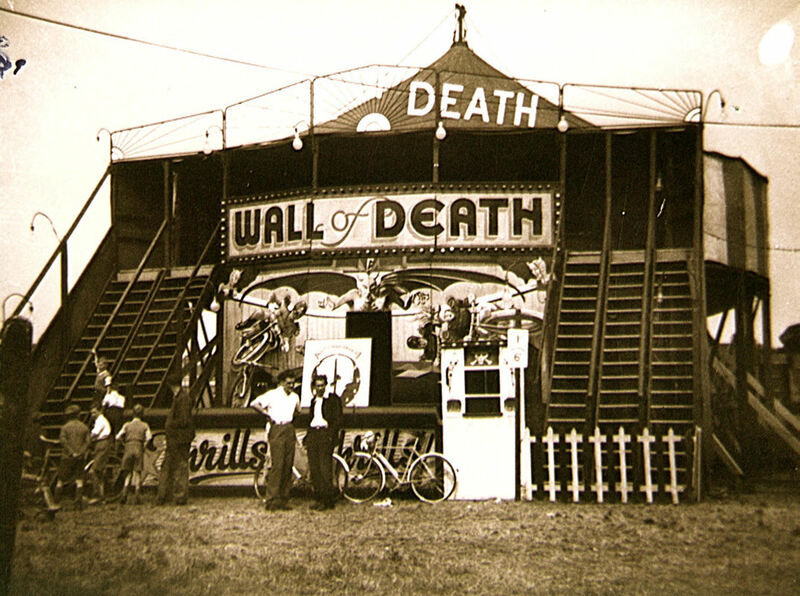 The Ken Fox Wall of Death was built in 1995 by Ken Fox and his colleagues. It was built in a massive ship yard at New Brighton and was completed in just 20 weeks, a mammoth task! After being built up for trials at New Brighton, the Wall made it's official travelling debut at the 1995 Rempstone Steam Rally. The Wall itself is 20ft high and 32ft diameter. It is constructed of Oregon Pine, the aquisition of a sufficient quantity of which was no mean feat.